Welcome to the EMiC community. Part of our mandate is to provide a social space where our members can share information, collaborate with one another, and publicize our research for the greater Canadian community. We’ve set up a blog space where you can post information about your research or make general announcements. We encourage everyone to participate on this blog, and we would love to hear what you’ve been up to in your research. Help us document the study of Canadian modernism by participating regularly on our blog. 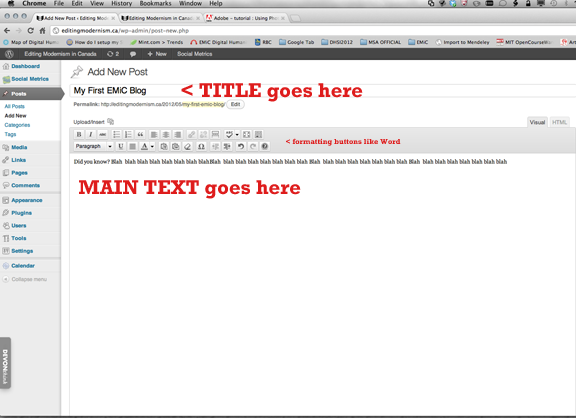 This page will teach you how to post on the EMiC blog. These step-by-step instructions will guide you through the process of logging into our site and publishing your thoughts. Once you submit this form, you will be assigned a username and password for the EMiC website. This may take up to a week to process. Make sure you change your password right away. 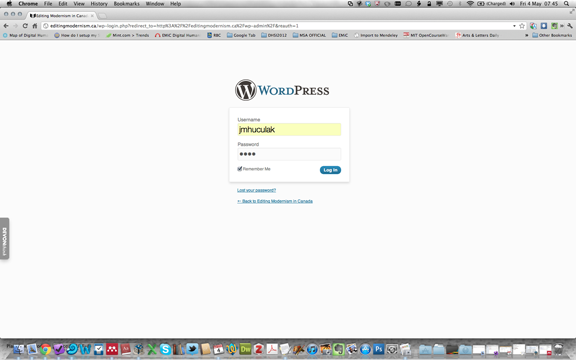 This is the nerve center of WordPress. If you ever get lost, simply click “Dashboard” in the top navigation menu. 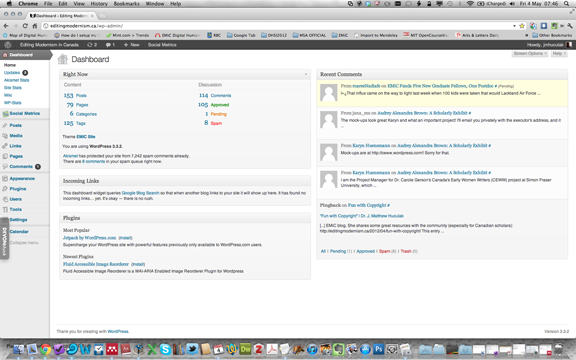 Next, click in the main body of the blog post. You may write directly in this box, or paste text from another application (I always like to write my posts in a text editor and paste them in just in case I lose my internet connectivity). Next, on the right-hand side you will see a “Categories” menu. 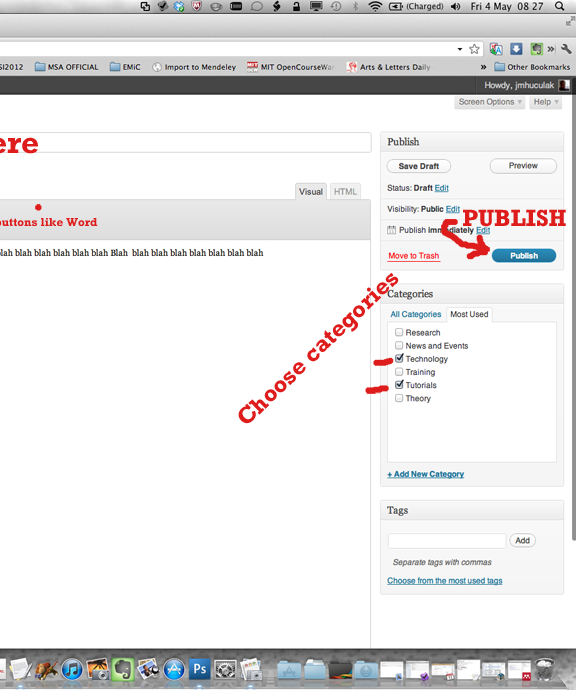 Choose which categories best fit your blog post. Is your post about Research? News and Events? Etc. 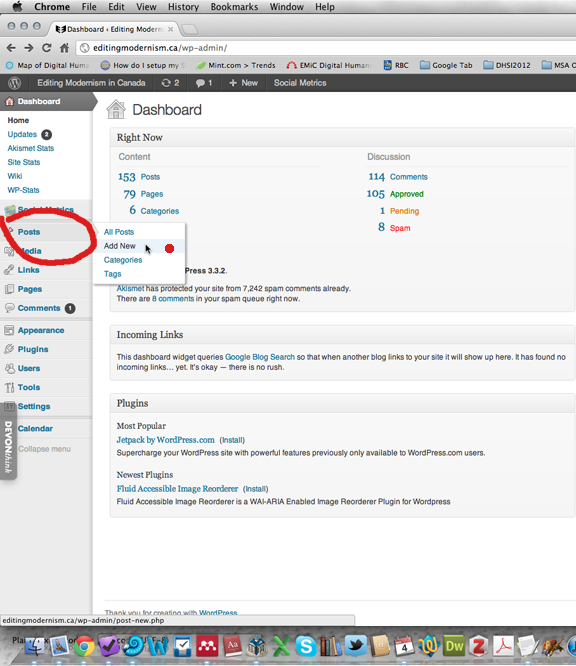 You’ll note that I choose to click “Tutorial” and “Technology” in this post since I am training you how to use WordPress. Our project is all about collaboration, and there is no better way to share your work than periodically posting on our blog.